I pulled out my wooden snowflake elements and inked them up with Versamark ink and covered them with Gold Stampin’ Emboss Powder. I used them as the three square elements in the sketch. I think these snowflakes are so pretty that I wanted them to be the stars of the show. I added a layer of black striped vellum from the Winter Wonderland Designer Vellum Stack to the white card base. I then cut a Whisper White mat and did some crazy stitching with my sewing machine, which needed a good dusting off. I added a sentiment made using Black Glimmer Paper cut out with a Christmas Greetings Thinlits die. I added a little Gold Cording and a White Perfect Accent, which I colored black with a Sharpie. All in all — a very simple card with a lot of white space. And not a bit of stamping. It’s rare that I can make a card with one of these characteristics, let alone both of them. We hope you’ll play along and make your own card using the sketch. You can see all of the different ways the design team used it at the Freshly Made Sketches site for some inspiration. This entry was posted in Christmas, Freshly Made Sketches Challenge. Bookmark the permalink. You KNOW you had me with the snowflakes! And that black glimmer sentiment is perfect! The snowflakes are the star of the show! I love them embossed in gold. What a fabulous Christmas card! Your snowflakes definitely are the star of the show and your stitching is fabulous! Love this card! They are beautiful in gold. I love it paired with black! Yes,those snowflakes sure are the stars on your card!! What a beautiful….beautiful card Amy!! I love the gold and the glittery merry!! Wow, Amy! The details that you added to each element of this card make it amazingly beautiful. 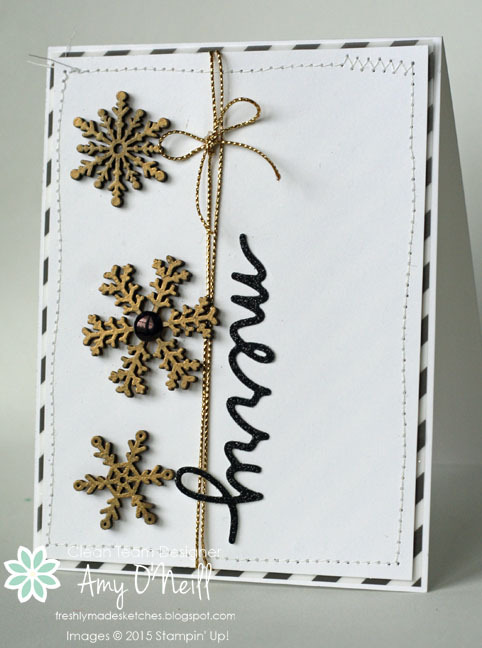 The gold embossing on the snowflakes, the black glimmer paper sentiment, the gold cording… just WOW! I love this card! Gorgeous card Amy! I love how you combined all these fabulously textured elements so expertly. I didn’t miss the stamping at all! Look at you rocking the snowflakes! You and Jen make me wish I’d ordered some of these! Such a pretty card! Love the glitter and shine! I am loving those snowflakes! They are my go-to embellishment at the moment. You’ve created a wonderfully clean festive card!